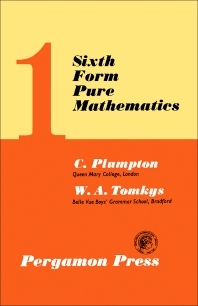 Sixth Form Pure Mathematics, Volume 1, Second Edition, is the first of a series of volumes on Pure Mathematics and Theoretical Mechanics for Sixth Form students whose aim is entrance into British and Commonwealth Universities or Technical Colleges. A knowledge of Pure Mathematics up to G.C.E. O-level is assumed and the subject is developed by a concentric treatment in which each new topic is used to illustrate ideas already treated. The major topics of Algebra, Calculus, Coordinate Geometry, and Trigonometry are developed together. This volume covers most of the Pure Mathematics required for the single subject Mathematics at Advanced Level. Early and rapid progress in calculus is made at the beginning of this volume in order to facilitate the student's progress along the most satisfactory lines in Pure Mathematics, in Theoretical Mechanics and in Physics. The worked examples are an essential feature of this book and they are followed by routine exercises within the text of each chapter, associated closely with the work on which they are dependent. The exercises at the end of each chapter collectively embody all the topics of that chapter and, where possible, the preceding chapters also.